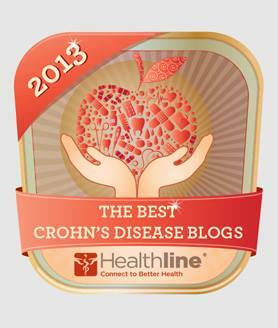 The other day I learned that Healthline chose The Crohn’s Colitis Effect as The Best Crohn’s Disease Blogs of 2013! To say that I was shocked and stunned would be an understatement! I started The Crohn’s Colitis Effect a few years ago after some friends encouraged me to speak out about everything that was happening to my son and family. If you haven’t read the blog post I wrote on it, you can find it here. I originally started it as just a Google+ Page, essentially blogging using the social media platform as a way to advocate on Inflammatory Bowel Disease ( IBD ), Crohn’s Disease, and Ulcerative Colitis. It wasn’t too long after that I decided to create a full website and blog. I never thought that The Crohn’s Colitis Effect would ever turn into anything more than a place where some of my family and friends would come to find me rant about the sufferings of my son. Since walking this journey, I’ve met incredible people! People who inspire me and give me hope. I hope and pray that the work here that I do will one day assist in making their lives, along with my son’s life, better! I am extremely honored and humbled by Healthline’s award. THANK YOU so much Healthline! This means more to me than I can truly describe!